Everyone makes mistakes while trying to prepare a fabulous Thanksgiving turkey. But this year, RELAX! You’ve got it under control with these 10 easy tips that will save your turkey and make you look like a culinary rock star! 1. Not giving your turkey enough time to thaw. Chances are good that you’re going to purchase your turkey frozen, because that is how the majority of them come. It’s crucial to allot enough time for yours to thaw safely. The best way to get that frozen bird thawed is in the refrigerator. It will defrost at a rate of about four pounds per day, so the average 16-pound turkey could take at least four days to completely thaw! If you fail to give your turkey enough time to thaw, it will cook on the outside, but the inside will be super raw. Gross! 2. You don’t let your bird come to room temperature. 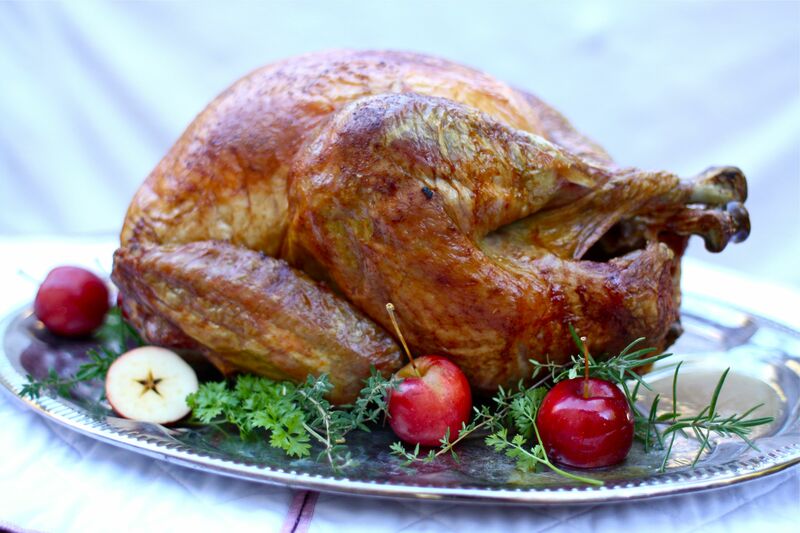 Take your turkey out of the refrigerator and park it on the kitchen counter for 60-90 minutes before roasting. Unpackage it and remove it from its brine (the liquid). This ensures that you cook an equally moist bird. If you’re a germaphobe, rest assured that this is safe and sanitary for that hour and a half. The middle of the turkey takes the longest to cook, so when you’re putting food into the cavity of the bird to pull out and eat later, it could be a potential health hazard. For the stuffing to be safe to eat, it needs to reach 165 degrees. However, by the time it reaches that temperature, the rest of the turkey is overcooked. Your options are to have an overcooked bird with properly heated stuffing or a turkey cooked to perfection but the stuffing is mushy and undercooked. Play it safe and bake the stuffing separately so that you can enjoy both foods. You’ll be glad you avoided this turkey mistake! 4. Putting a damp bird in the oven. It’s important to pat your turkey dry before you roast it. Don’t neglect drying inside the cavity of the bird as well. Many people forget about that because they are stuffing it. You want the bird to be dry if you wish to have a crispy, golden-brown turkey. If you want a savory bird, you need to season it thoroughly. This means inside and out. You could simply sprinkle some salt in its cavity or loosely stuff it with herbs, lemons, onions, and fennel (not to eat). This adds flavor to the meat and the aroma will make your kitchen smell great too! 6. Not using a roasting rack. It boggles my mind how many people don’t use a roasting rack. The roasting rack helps to cook the bird evenly. Without it, the meat on the bottom ends up dry, overcooked, and often burned. If you don’t want to waste part of your turkey each year, invest in a rack for your roasting pan. You can use it for roasting other meats too, so you’ll get use out of it more than just once a year. 7. You skip the meat thermometer. Many people skip using a meat thermometer and just rely on the plastic pop-up thermometer. This will get you into trouble. Use a standard meat thermometer that is metal and designed to withstand oven temperatures. Position it in the thickest part of the turkey’s thigh, because the dark meat of the turkey thigh takes longest to cook. When the thermometer reads 165, take it out! 8. Cooking at too high of a temperature. If you cook your turkey at too high of a temperature, the skin will burn and the meat will likely be undercooked. Yuck! It’s best to start roasting the bird at 475-500 degrees for the first 20-30 minutes and then reduce the heat to 400 degrees until the bird reaches 165 degrees. 9. Roasting the turkey well over 165°F. Maybe you’re using a meat thermometer and you’re roasting the turkey the oven at 400 degrees, but you still cook the turkey well past 165 degrees. If you’re letting the bird’s thigh temperature reach 180 degrees, it will be dry. There is no sense in waiting this long because the meat is perfectly safe for eating at 165 degrees. You could even cook it to just 160 degrees because the meat will continue to cook for a little while after you remove it from the oven. 10. Your turkey carving is shameful. Allow the bird to cool down for about 15 minutes before you start the carving process. Start with cutting the leg quarters away first, and then work on the breast meat. Try to take the breast meat off of the bone in one large piece and then slice it crosswise to ensure thicker, even slices. Cut the thighs into larger pieces. Only cut off what you will eat right away. If your family doesn’t plan to eat most of the bird during dinner, carve only half of the turkey. Carved meat will dry out faster than if it remains intact on the carcass.